Niguma, a yogini, bodhisattva, and dakini, lived presumably in the eleventh century. There is not much information about Niguma’s life nor about her birth. Information about her is rather controversial and is wrapped in mystery. According to one legend Niguma was born in Kashmir, in a region called the Country of the Great Magic. During the lifetime of the previous Buddha this land was cowered with water and belonged to the King of Nagas. More recently, this region has become the birthplace of many mahasiddhas, among whom was also Naropa. The great bodhisattva-yogini Niguma was born there. According to some sources she was Naropa’s sister, according to other sources – she was his wife. In her previous lives Niguma developed the enlightened mind and was following the path of Bodhisattva. And this time she took a decision to be born as a woman who would benefit and liberate others. During three long kalpas she gained perfection on her spiritual path, and in that lifetime she received few instructions from several spiritual masters. 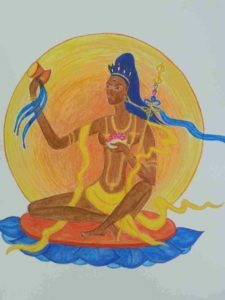 With the help of these instructions she had a direct perception of the true nature of phenomena, attained enlightenment and became the dakini of wisdom. Niguma was not only Naropa’s wife/sister, but also his disciple. When Naropa divided teachings between his disciples to Marpa he transmitted Guhyasamaja and Hevajra tantras and the Six Yogas, which he himself obtained from Tilopa. To Niguma he gave a special transmission of the Six yogas, originating from the five essential mandalas. The most famous Niguma’s disciple was Mahasiddha Khyungpo Neljor. When on his way from Tibet to India, Khyungpo Neljor was enquiring about teachers and looking for possibilities to obtain the teaching. Though he studied a lot, he had a feeling that his practice does not have much value. When Niguma’s name (who attained the state of the rainbow body and who was very rarely seen in human form) was mentioned in his presence, Khyungpo Neljor had tears in his eyes and felt the hair on his body stand on end. He hurried to the cemetery where, among a gathering of dakinis, Niguma used to appear from time to time, and asked for initiation. During the initiation ceremony Niguma urinated into a scull and offered this drink to Khyungpo Neljor. The moment he drunk her urine Khyungpo Neljor attained the vision of the gods of the mandala. Later he obtained many teachings from Niguma and on his return to Tibet became the founder of the Shangpa Kagyu lineage, which is preserved to our days. In the story of Niguma can be found a taste of true tantric Buddhism. Vajrayana starts where Buddhism goes out of the monastery walls, goes out of the limits of habitual rules and rituals. It starts to worship female deities, and there also appears female practitioners, yoginis, who are worshiped equally with men. In Mahamudra the main deity is dakini. The principle of dakini was never mentioned in Buddhism before Vajrayana. Before Vajrayana flourished Buddhism was characterized by rational and philosophical doctrine, while tantrism is characterized by going out of the limits of monastic sangha, by expansion of sangha to the size of entire world. Women are a symbol of the sangha of the entire world, because women give birth to others. When we analyze stories of tantric Buddhism we speak about magic and vitality. The method Niguma used to awaken Neljor is magic of vitality. Urine is an antidote for the stagnation of blood, stagnation of energy. This story shows the importance of yogic training of a disciple by his/her teacher. Though philosophical understanding of the Teaching is important, something more is needed to allow the teaching to gain life. Here a role of the female principle becomes vital. This moment is important for the understanding of Vajrayana. During the initiation ceremony Niguma urinated into a scull and offered this drink to Khyungpo Neljor.This ritual defilement served as the basis for a new understanding of discipline. In Vinaya-pitaka discipline is based upon a code of rules, and the teaching is intended for men. In Vajrayana, discipline is based upon infinite feelings, and there is not rigid frame of rules. rather it is a state of mind of a practitioner that determines self-discipline. This is the living essence of Vajrayana. While Naljorpa was searching for a break-through in his understanding, it appeared that his break-through was in vitality. A break-through happens via softening. The key practice demands break-through. A starving ascetic or a wise guru provokes trust and respect, while an ascetic or a guru, who drinks urine is rather ridiculous. An image of an ascetic, of a guru, of an all-knowing “I” is breaking down. An element of female mockery at a yogi was always present in Vajrayana. It shows that the entire ocean of teachings is nothing more than excrements of realized yogini. Niguma shows that all Naljorpa is looking for is just urine and by this mockery, she softens the ascetic way. This does not humiliate him, but rather makes visible that which was invisible before. He lacked an appreciation of irony towards himself and towards his own knowledge. In many stories of mahasiddhas’ enlightenment, there appears a woman who helps a yogi to attain enlightenment. Mahasiddha Luipa attained enlightenment after he was served rotten fish by a mistress. The moment he throws them away she becomes angry and utters: “If until now you distinguish between good food and bad food, then how will Dharma come to you?” So Luipa realized that by distinguishing one from the other he keeps away from enlightenment. Mahasiddha Saraha was an already acknowledged master who mastered many siddhas. Once he asked his wife to cook him something from radishes. His wife poured sour cream on top of radishes and served him, but he was in deep meditation so she decided not to disturb him. He meditated for 12 years, but as he was back from his meditation his first question was: “where is the radish?” His wife laughed at him. So it became apparent that what he lacked was just a little irony towards himself and his own knowledge. After hearing his wife’s words Saraha decided to dissolve concepts and habitual thinking in the natural luminosity of mind and attained enlightenment. Mahasiddha Vyala, a Brahmin, was an alchemist and tried to produce an immortality elixir for many years, but could not succeed. Once his wife went to bath in the Ganges and a lily flower became entangled in her hair. As she came home, the flower’s pollen accidently got into the unsuccessful solution. The pollen was exactly the missing ingredient, the ingredient for which Vyala was searching for so many years. Now the elixir was ready. There are also quite many examples in our life: penicillin was obtained as a result of a mistake: after the laboratory assistant washed a retort poorly, the next morning the researcher mixed usual ingredients and found penicillin in it. Such things happen all over: where a dry scientific approach gets into a blind alley, light negligence, some portion of self-irony may cause a soft break-through. Naropa was a respected scientist and teacher at the university, until the day an ugly old woman appeared before him, and while spitting into his books, told him that all his knowledge is worth nothing. After that Naropa left the university and made it to India where he became Tilopa’s disciple and Vajrayana lineage holder. We know that Buddha when he was exhausted by ascetic practice was offered a glass of milk by a young woman. It happened before the night of his enlightenment. Even though it was considered impure to accept something from woman’s hands, Buddha accepted the milk with thankfulness. Later a concept of the middle path came to life. Femininity is an unpredictable and accidental “factor”. A women’s energy gives a push for the proper directing of the mind. This is a self-irony in a good sense of it, irony over the feeling of self-importance which often becomes a crucial factor for a break-through.